With the holiday season in full swing, we hope you’ve made plans to visit Rowan County to participate in our extensive list of holiday activities! No matter where you’re coming from, or which event you’re headed to, we’ve got a coffee shop nearby! We know that all good holiday cheer starts with proper caffeination. We’ve put together our best Rowan County coffee guide [holiday edition]. Check out our local one of a kind coffee shops throughout Rowan County and give their delicious holiday drinks a try! RED VELVET MOCHA: The Holy Grind is serving up Red Velvet Moachas as their stand out specialty dessert drink this holiday season! This drink is perfect to put any age in the holiday spirit! Grab it as a caffeine boost, or as a special sweet treat! 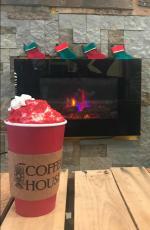 WHITE CHRISTMAS LATTE: You’re not the only one dreaming of a white Christmas, Mean Mug is too! They’re wishing for snow and serving up their White Christmas Lattes now through December 21! 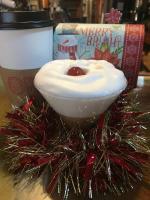 The White Christmas Latte is a gingerbread latte complete with foam and a cherry. Grab one today to get in the holiday spirit! FROSTY’S FAVORITE: Editions is serving up Frosty’s Favorite! Coffee made with espresso and hot steamed milk, sweetened with Vanilla and Hazelnut and topped to perfection with whip cream, white chocolate drizzle and finished with a sprinkle of cinnamon. 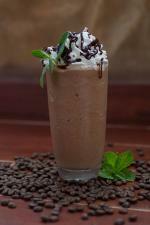 Frosty’s Favorite can be served as a latte (hot or iced) or as a frappe. DIRTY SANTA: If you’re on the naughty list this year, you don’t have to worry. French Express has a drink that’ll keep you company. Their Dirty Santa is an almond and peppermint blend, complete with whip cream! 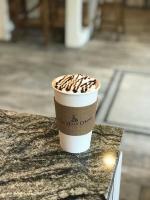 PEPPERMINT MOCHA FRAPPE: If you’re hoping to get some peppermint twists in your stocking this year, then you’ll love Koco Java’s Peppermint Mocha Frappe. The perfect energy booster before a day spent with the kids, or maybe as an afternoon pick me up after spending the day with the kids! We can’t wait to see you in Rowan County! Don’t forget to check out our complete list of holiday events happening this season! But first, coffee.